Texas Executes Workers’ Compensation Claimant For Killing A Witness And His Son And Two Other Witnesses. The Day Of The Dead, When The Living And The Dead Party Together. One day in 1987, when I was in uniform as an Army medic – part of the 3rd Infantry Division stationed at Hunter Army Airfield in Georgia-- a call came on the “nine line”, the medevac coded alert system. A U.S. soldier had been gravely injured during a peacetimecombat readiness evaluation. Medevac missions are ranked as urgent, priority, or routine. This was an urgent call so I grabbed my gear (containing among other things- bandages, abdominal dressings, flexible plastic coverings, IV clamps and morphine), and boarded the helo. Within 5 minutes, the Black Hawk blasted its twin 1,600 horse power engines, spooled up to a deafening roar, and hoovered over the terrain at 180 mph (I sure miss that!). Barely on the ground, we hustled the stocky, young, wounded infantryman onto a stretcher and into the helo. He had a full sleeve tattoo and had just turned 23. He had been hit and crushed by a heavy supply box that had been air dropped. He had sustained severe traumatic injuries. There was blood all over his face so I couldn’t see him well. I wouldn’t be able to remember what he looked like even if I had seen him well, as at that moment my priority was clear: clear the airway, stop the bleeding, treat for shock. That is how I had been trained in a rigorous twelve week emergency medicine course with four additional weeks of medevac individual training. There was nothing gory about the injury. Sure, he had been knocked out cold and there was this certain glazed look in his eyes as he came in and out of consciousness, but he wasn’t heavily lacerated. Once we arrived at the Army hospital, the Army doctors placed a ventilator tube snaked out of his throat as a machine pumped air into his lungs. Unfortunately, his injuries were too grave and he had too many co-morbidities. Thus, he flat-lined despite our best efforts at CPR with a defibrulator. A “commo blackout” was immediately declared. This is the Army’s policy of shutting down communication when a soldier had died to prevent unofficial word from reaching their families. Later that night at exactly 2:59 AM, after everyone else had gone home and I remained filling out paperwork related to the event, I looked up and saw a young man, roughly 23 years of age, standing before me in full uniform at attention. Annoyed, I asked him how he had gotten in. He just smiled, gave me a military salute with his right hand, and walked silently past the front door. The next day, my commanding officer brought in a picture of the deceased soldier from his graduation from basic training to put in our file. At the sight of it I dropped my coffee cup. It broke on impact on the ground, and I got a bone chill throughout my body. This had been the very same young man whom I had seen at my desk after he had died. I can remember every detail and every ounce of that moment as if it were yesterday. In fact, I’ve carried that memory forward through my entire adulthood. One day it occurred to me that one day we’re all going to be dead, that we will all be dead much longer than we get to be alive, so if one can do something while here on Earth and alive, that's a good thing. Nothing moves us humans who are living quite like the supernatural. 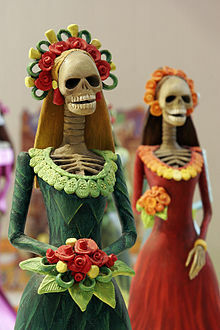 In Mexico, el Dia de los Muertos, or the Day of the Dead, begins on October 31st and carries on until November 2nd. Celebrations honoring the dead date back as long as 2500 to 3000 years. The festival that developed into the modern Day of the Dead fell in the ninth month of the Aztec calendar, about the beginning of August, and was celebrated for an entire month. The festivities were dedicated to the goddess known as Mictecacihuatl or as the "Lady of the Dead", corresponding to the modern La Calavera Catrina. 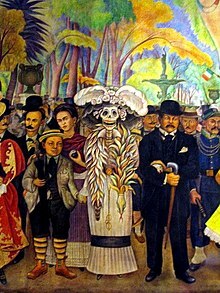 Diego Rivera's Sueño De Una Tarde Dominical en la Alameda Central features a central character of a Calavera Catrina. By the late 20th century in most regions of Mexico, practices had developed to honor dead children and infants on November 1, and to honor deceased adults on November 2. November 1 is generally referred to as Día de los Inocentes (Day of the Innocents) but also as Día de los Angelitos (Day of the Little Angels); November 2 is referred to as Día de los Muertos or Día de los Difuntos ("Day of the Dead"). Celebration styles and rituals vary widely throughout the various regions and sub-cultures of Mexico. In one exemplary ritual, on October 31, All Hallows Eve, the children make a children's altar to invite the angelitos (spirits of dead children) to come back for a visit. November 1 is All Saints Day, and the adult spirits will come to visit. November 2 is All Souls Day, when families go to the cemetery to decorate the graves and tombs of their relatives. The three-day fiesta is filled with marigolds, the flowers of the dead; muertos (the bread of the dead); sugar skulls; cardboard skeletons; tissue paper decorations; fruit and nuts; incense, and other traditional foods and decorations. 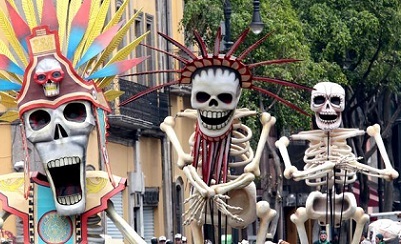 When I was young growing up in Mexico City, the evening of November 1 came alive with giant skeleton marionettes, costumes, bands, food and drink and a parade from the Angel of Independence through the historic Zocalo square rife with floats. People danced and dressed up like cadavers with white faces which were humorous and whimsical. Reminders of death and life after death were all over the city, in every market, store and home. Papel picado (brightly colored tissue paper flags) in orange, purple and black was everywhere as well as trails of orange colored confetti, that in actuality were petals of cempoalxochitl, the orange-colored marigold, that people blew on the streets so the spirits of the dead could find their way home. Here was life in the midst of death, being celebrated with color, food, and laughter. This was not a scary or dark event as several multi-generational families gathered around their carefully decorated graves of their beloveds. In fact, the cemetery where my younger sister, Edith, is buried was lit with hundreds of candles sparkling like stars in the sky. Here my grandmother, along with several aunts and uncles, told stories, sang, shared and talked to those they had lost. It was powerful to see and powerful to know that death cannot separate us from those we love and we rejoiced that we had escaped death and lived yet another year. All around, it was a festive atmosphere illustrating the circle of life. Of course, I recognize that I am speaking to the loveliest parts of my childhood experience and there is probably another side to this that might not be quite as wonderful- as losing a loved one hurts no matter how much time goes by. Still, the atmosphere was like nothing I’ve ever experienced. If you are able to attend a local celebration, I recommend it. A little bit of interesting tidbits. More than 7 in 10 Americans believe you’ll go to heaven if you’re good, and nearly 6 in 10 think you’ll go to the other place if you’re bad. In the United States, followers of different Christian faiths often tend to be bigger believers in heaven than the national average. More than 9 in 10 Mormons believe in heaven, and more than 8 in 10 Protestants agree. So, be good. Have a Safe and Happy All Hallows Eve. 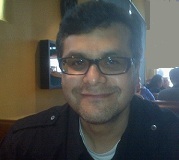 Jorge Alexandría is a U.S. Army veteran and claims adjuster who was born in Mexico City. His education began in the U.S. during his youth. He has a Master’s Degree in Public Administration from California State Polytechnic University, Pomona. He lives in Corona, California, with his scream-queen wife and monster kids and their friendly ghost dog. He doesn’t know it yet, but he’s been dead since before he was born. He can be reached at Riskletter@mail.com. The views and knowledge expressed in this article are Jorge Alexandría’s alone.